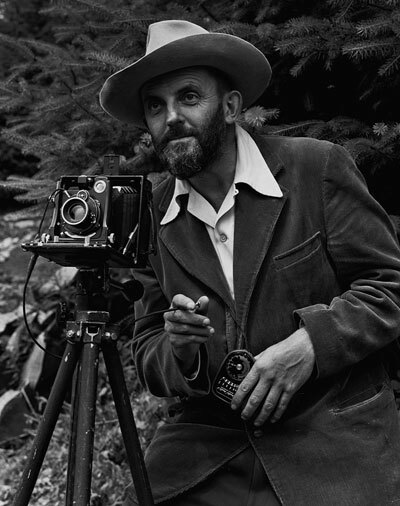 PHOTOGRAPHS OF ANSEL ADAMS (20th February 1902–22nd April 22 1984) reveal a big, burly man, with a permanent smile on his face, permanently donned with a large Stetson hat. Watching the above short documentary, we get an even greater sense of his character—modest, approachable and extremely talented, not only as a photographer but also as a musician. 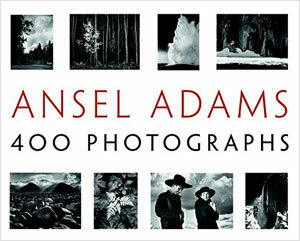 Adams started taking photographs as a young boy and immediately displayed an artistic aptitude for capturing beauty. Known for his distinctive black and white landscape photographs of the American West, in particular the Sierra Nevada and Yosemite National Park, his work possesses that rare ability to transform geographic reality into an intensely emotional experience. Born in San Fransisco, Adams was a shy and restless child, with very few friends. It was the piano, however, that gave him the creative outlet he yearned for, which he took up playing at the age of 12, imbuing within him an appreciation for exactitude and technique that would ultimately influence his approach to photography. Similarly, his father’s interest in the writings of Ralph Waldo Emerson—Transcendentalist and advocate of individualism and a love of Nature—instilled within the young boy a delight of the great outdoors and the freedom it affords the inner spirit. Yosemite Valley, to me, is always a sunrise, a glitter of green and golden wonder in a vast edifice of stone and space. I know of no sculpture, painting or music that exceeds the compelling spiritual command of the soaring shape of granite cliff and dome, of patina of light on rock and forest, and of the thunder and whispering of the falling, flowing waters. At first the colossal aspect may dominate; then we perceive and respond to the delicate and persuasive complex of nature. J. Malcolm Greany, Ansel Adams. As Adams became more enthralled with taking photographs, he also found inspiration in the work of Edward Carpenter (1844–1929), British philosopher and poet, who championed a form of “mystical socialism” and was a close friend of the Indian Nobel Laureate, Rabindranath Tagore. Despite the financial challenges of pursuing an artistic career, Adams’ work and reputation flourished. His technical mastery was legendary—he revelled in the theory and practice of the photographic medium becoming the leading expert in his field. He even developed the renowned and highly sophisticated “Zone System”, a technique used to control exposure and development, enabling photographers to visualize an image and then produce a photograph that exactly expressed that visualization, elevating the process akin to a mystical experience. Indeed, his photographic images sought to exemplify the psychological experience of beauty in the natural world through the lens of his visual art. By creating a sense of the sublime magnificence of the world around him, he was able to infuse the viewer with an overwhelming feeling of the transcendental. 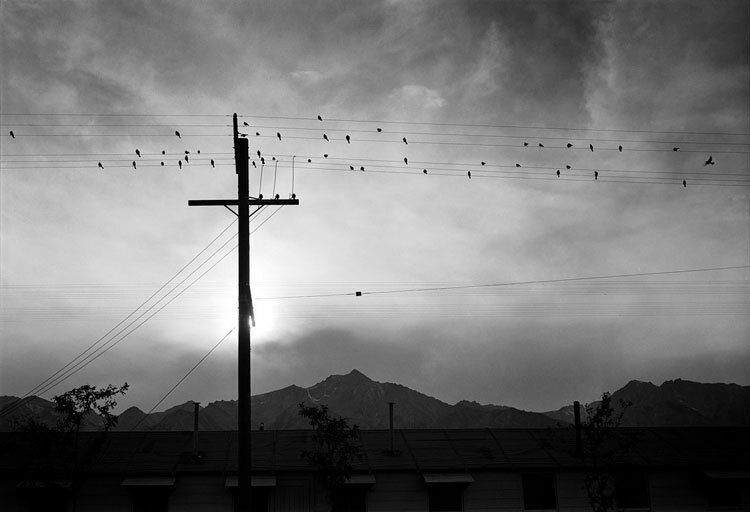 Ansel Adams, Manzanar birds on wire. Adams’ entire life became a living embodiment of his personal philosophy—he devoted much of his time, when he wasn’t shooting pictures or playing the piano, championing environmental issues and raising the public’s awareness of the need to preserve the land. At one with the power of the American landscape, and renowned for the patient skill and timeless beauty of his work, photographer Ansel Adams has been visionary in his efforts to preserve the country’s wild and scenic areas, both on film and on Earth. Drawn to the beauty of nature’s monuments, he is regarded by environmentalists as a monument himself, and by photographers as a national institution. It is through his foresight and fortitude that so much of America has been saved for future Americans. No doubt Adams would have marvelled at the technical advances in digital photography and the way in which anyone now is more than capable of taking a decent photograph at the tap of a thumb. We have to wonder, however, whether it has all been at the expense of the “creative eye”, for it is hard to imagine that the likes of the photographic genius of Ansel Adams will ever be seen in this world again.